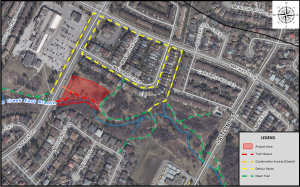 The purpose of the Maitland Park Stream Restoration Project is to provide protection to the Chinguacousy Trail within Maitland Park while simultaneously identifying opportunities for renaturalization of the banks and parkland. This work will offer more long-term and sustainable protection to the area. 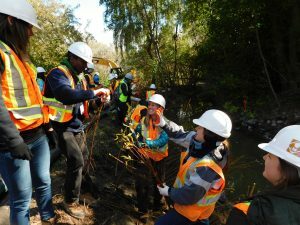 TRCA is working on behalf of the City of Brampton to help restore waterways within the city. The funding for this project was provided by the Clean Water and Wastewater Fund (CWWF), which aims to improve and maintain reliable drinking water, stormwater and wastewater infrastructure to communities. Construction was completed within Maitland Park in January 2019, and now final restoration activities are scheduled to commence. Trees and shrubs will be planted within and around the work area by the end of May 2019. No impacts to park access are anticipated as a result of this work. Asphalt paving is anticipated to be completed by the end of the summer. For previous updates, please see Past Project Updates. During an inventory walkthrough performed in 2009, Toronto and Region Conservation Authority (TRCA) staff noted several erosion control structures within Maitland park which were in various states of deterioration. 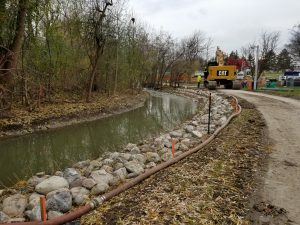 These structures included a concrete channel, as well as several rip rap and gabion basket revetments which protected the nearby park path and sanitary sewer line. In 2018, this site was identified as a candidate for the Clean Water and Wastewater Funding (CWWF) to be addressed by TRCA on behalf of the City of Brampton. 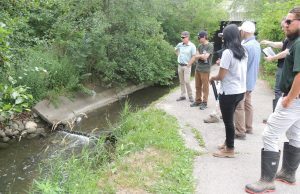 This project was also identified as an ideal candidate for a collaborative initiative between TRCA and the City of Brampton with input from the Canadian Chapter of the International Erosion Control Association (CAN-IECA). 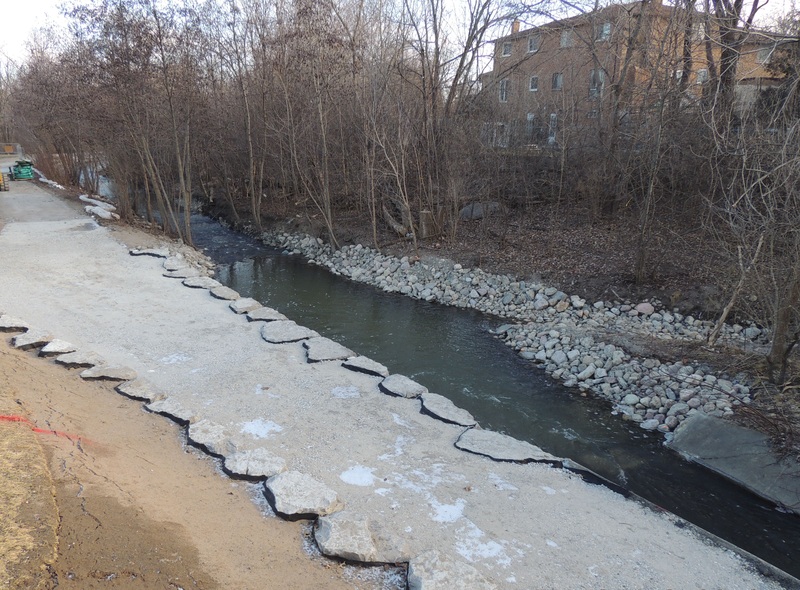 This collaborative effort facilitated a holistic approach to addressing various concerns related to erosion, ecology, public safety and other disciplines. Concrete channel and rip rap revetment, causing erosion of the bank adjacent to Chinguacousy Trail (Source: TRCA, 2018). 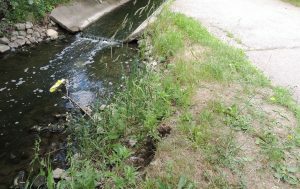 In order to meet and exceed the goals set out for this project, TRCA plans to incorporate a series of improvements along this stretch of Spring Creek (a tributary of Etobicoke Creek) within Maitland Park. The design includes the removal of a portion of the pre-existing concrete channel that extends downstream of the bridge at North Park Drive. Removing a portion of the concrete channel would provide opportunity for channel habitat improvement. The design also includes bank renaturalization and a pool and riffle sequence, to reduce flow velocity and improve channel morphology. The installation of a vegetated buttress and armourstone wall will provide the bank with stability and mitigate erosive forces currently threatening the adjacent public trail. In early January, TRCA staff returned to Maitland Park following the holiday break. They have now completed the construction works within the park and the trail has been reopened for use by the public. Final restoration including plantings and repaving of the Chinguacousy Trail within the former project area will be undertaken in the spring, weather permitting. TRCA construction crews are continuing works at the most upstream portion of the project area in Maitland Park. 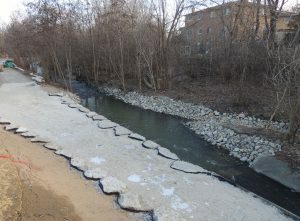 A portion of a concrete channel has been replaced with an armourstone structure (below) to provide additional protection to the channel and adjacent path from the erosive forces of the creek. In-channel works are now complete and staff are working on restoring the general project site. Due to frequent rain and storm events experienced this fall along Etobicoke Creek, the works at Maitland Park are now expected to be complete in January 2019. Once the work is complete, the path within the park will be reopened. Final restoration of the area is still planned for spring 2019, which will include plantings and repaving along the park trail. Please review the Notice of Construction Sign and Project Map (above) for additional information regarding the scope of the project, anticipated timelines, and impacts. For previous updates, please see Past Project Updates. The newly implemented armourstone wall (left) and cobblestone channel (right) at the upstream limit of the Maitland Park Stream Restoration Project (Source: TRCA, 2018). TRCA’s construction staff are now proceeding to the second phase of the works at the Maitland Park Stream Restoration Project site. This month they relocated the cofferdam used to isolate the in-stream work area within the upstream portion of the site. Works are currently underway with the installation of an armourstone wall adjacent to the existing park path. This wall will fortify the bank of the creek and protect the park path from damage caused by the erosive forces of Etobicoke Creek. Following the completion of the armourstone wall, staff will continue channel bed works, creating a pool and stone riffle sequence in the area. In general, this sequence will help slow water down to reduce erosion. The stone riffles provide grade control along the channel and the pools will consist of deeper and slower water which can create habitat for some aquatic species. 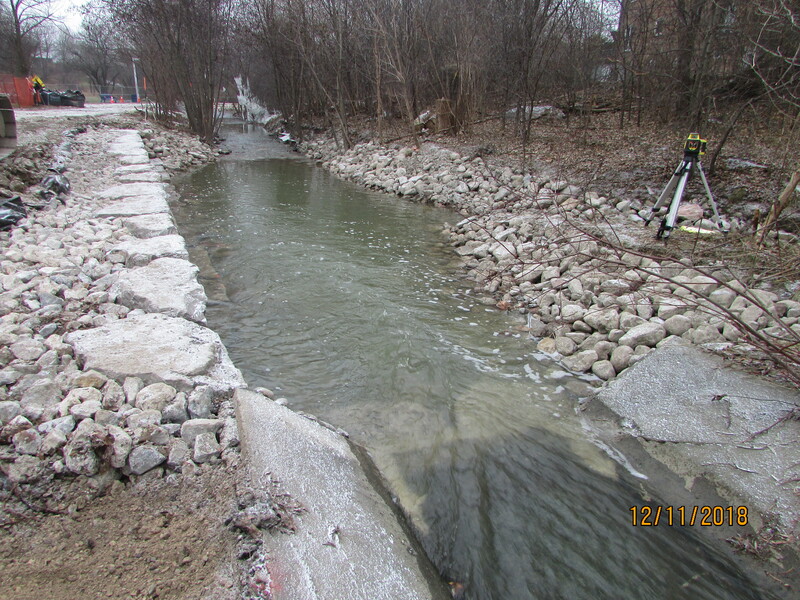 Photo of the recently installed vegetated buttress at the downstream portion of the Maitland Park Stream Restoration Project area (Source: TRCA, 2018). Construction staff have started their work on this stretch of Etobicoke Creek within Maitland Park. By-pass pumping equipment has been installed to divert water around the sections of the creek that staff plan to work in. Works are currently taking place at the downstream portion of the project area, where staff are constructing a vegetated buttress on the east bank. The vegetated buttress will stabilize the bank and in turn protect the adjacent park path from the erosive forces of the creek. The bioengineering plantings in the buttress aid with the structure’s stability while also providing aesthetic and ecological benefits. 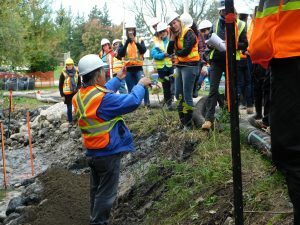 John McCullah from Salix Applied Earthcare discussing bioengineering techniques at Maitland Park (Source: TRCA, 2018). On October 16, 2018, John McCullah from Salix Applied Earthcare, an expert in the field of erosion control, led a workshop demonstrating innovative best management practices for erosion control works at the Maitland Park Stream Restoration Project site. 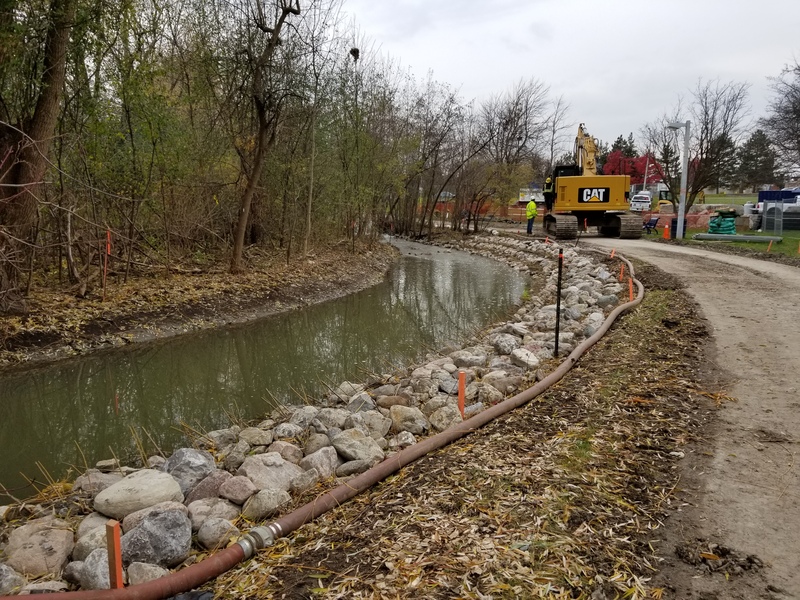 Stakeholders, staff from nearby conservation authorities, and other industry professionals were in attendance and worked with John and our construction staff to install a portion of the vegetated buttress that had been designed for the downstream portion of the project. The event was a success and attendees left with an experience that would enhance their professional approaches to similar projects in the future. Implementation showcase attendees work to install a portion of the vegetated buttress at Maitland Park (Source: TRCA, 2018). The restoration works for the Maitland Park Stream Restoration Project are planned to commence this month. In order to maintain public safety during construction, a portion of the trail will be closed off from public access. The trail closures and alternative routes related to this project are referenced below. Map of trail closures required for the Maitland Park Stream Restoration Project. (Source: TRCA, 2018). TRCA hosted a design charrette on July 16, 2018 with a variety of professionals from multiple disciplines, including fluvial geomorphology, construction management, water resources engineering, and planning ecology. The purpose of this meeting was to brainstorm innovative approaches to reinvigorating a portion of Etobicoke Creek within Maitland Park. Suggestions from the multi-disciplinary group were documented and incorporated into the concept and detailed designs. Core design and collaborative team discussing potential solutions for concrete channel within the proposed project area (Source: TRCA, 2018).